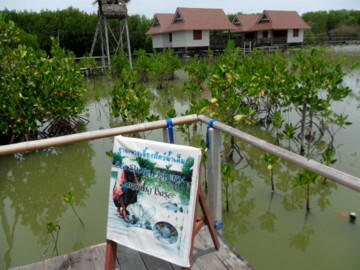 The Bang Khun Thien Museum is a community museum in the district of Bang Khun Thien on the west bank of the Chao Phraya River in southern Bangkok. The district is a narrow strip of land of about 5 km between the provinces of Samut Prakan and Samut Sakhon and leads to the only sea front in Bangkok! This short 5 km stretch of sea in the Gulf of Thailand doesn’t have a beach to boast of, which may be a blessing in disguise. 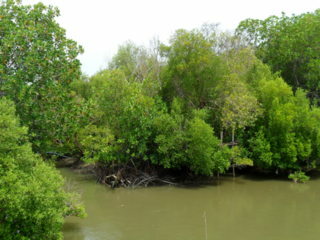 Instead the coast has mangrove preserving the ecological system in a low-lying area of about 1 – 1.5 m above sea level, 15 km to the west of the Chao Phraya estuary. 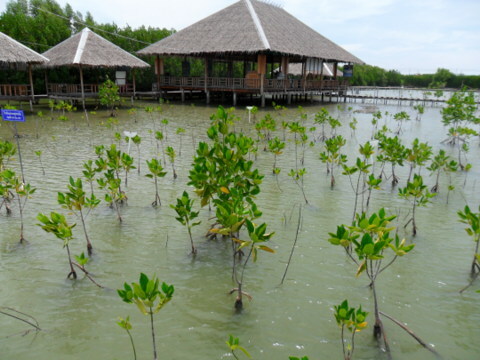 The mangrove trees in Bang Khun Thien serve a vital purpose in protecting the environment and have several functions. 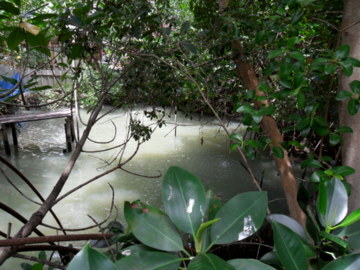 The residents who used to live here engaged in rice, vegetable and fruit farming as well as fish, shrimp, crab and cockle farming using tides to bring the water in and out of the ponds so as to maintain the ecological balance. The Bang Khun Thien Museum records the history and lifestyles of these old communities who have lived here for several hundred years. It’s one of the several community museums set up by the Bangkok Metropolitan Authority to preserve the cultural heritage of old communities in the city. Located in the premises of the Klong Phitayalongkorn School, the Bang Khun Thien Museum is housed in a modest wooden building. Photographs and displays of the implements and products of these communities trace the origins of these communities, their lifestyles and their commercial role in the area. The museum set by the Bangkok Metropolitan Authority (BMA) is in one room. The other room next to it is the exhibit room by the school. 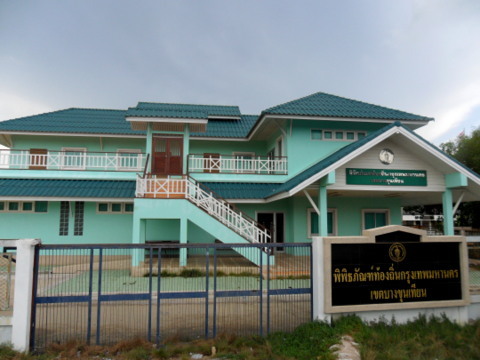 When I visited the Khun Khun Thien Museum again in May 2013, the new building for the museum next to the school is completed but the museum hasn’t moved in yet. 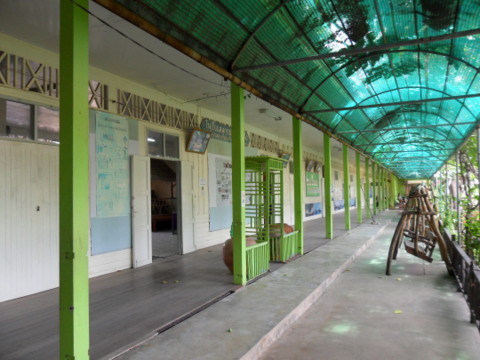 Let’s return to the old premises in the Klong Phitayalongkorn School. Bang Khun Thien was an important port in the Ayutthaya era. 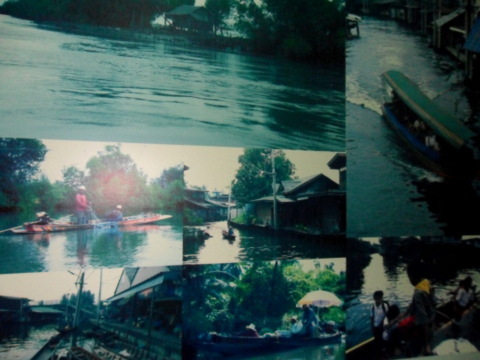 It’s located between the Chao Phraya River to the east and the Tha Chin River to the west. Several lateral canals linking the two rivers pass through Bang Khun Thien. The area became a link between Ayutthaya to the north and its principalities to the west and south. The Mons, originally from Myanmar, have sought refuge here in the 16th century. 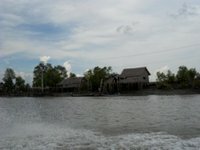 They have preserved their customs and culture in a community around Wat Bang Kradi. The ubiquitous Chinese immigrants have settled here since 1810 and engage in fruit cultivation, pig and poultry farming. The Khmers from Cambodia have been here since the Ayutthaya days and engage in farming. 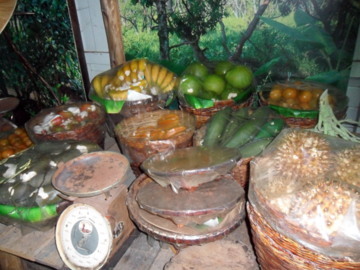 These diverse communities settled in the area and engaged in their own form of farming. A network of canals was dug for communications, irrigation and flood control. With land that’s rich and fertile, the area was reputed to be Bangkok’s fruit garden. 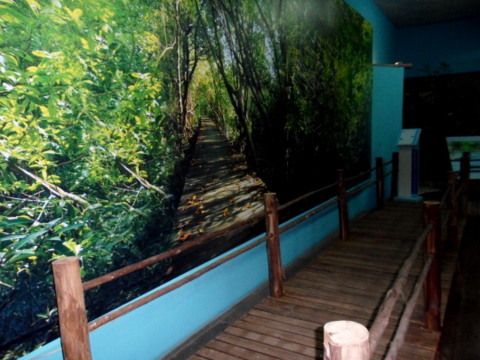 This mural and wooden walkway display simulates a walk through an environment that’s fast disappearing. So does this nostalgic collection of photos depicting the way of life back then. The co-location of the school and the Bang Khun Thien Museum is appropriate as both institutions have complementary missions. The museum preserves the history of the district, its way of life and natural environment. The school promotes a strong environmentally-conscious message to the students which is apparent in the exhibition area in the open shed and the other projects. 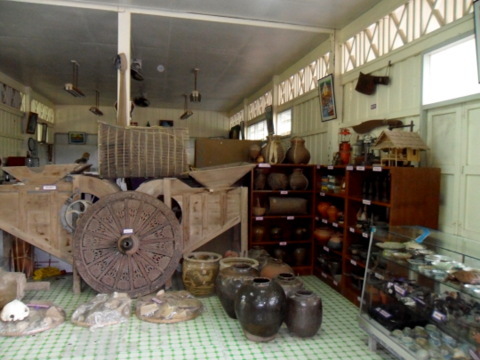 One of the rooms in the school displays old relics found in Bang Khun Thien and the tools in the traditional livelihoods in the area. 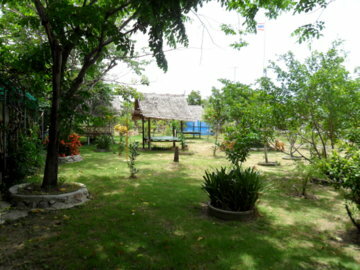 The garden outside the building consists of the various species of indigenous Thai trees. This project is meant to preserve these trees. The highlight of this visit is the school farm and nature project to the rear of the school. 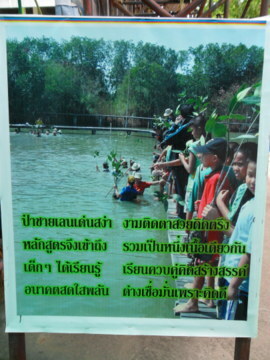 Here the school children set up an area with fish ponds and mangrove trees. The underlying message is to love nature and preserve the environment. However the model farms further on are on a grander scale. These projects are sponsored by government departments, the Armed Services and private companies. 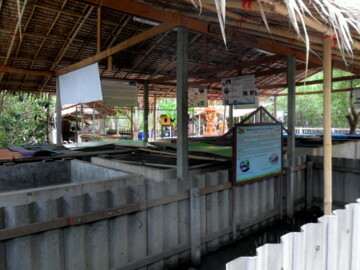 There are ponds to rear fish; shrimps and cockles to illustrate preservation of the environment and self-sufficiency, the use of natural resources to produce our food. 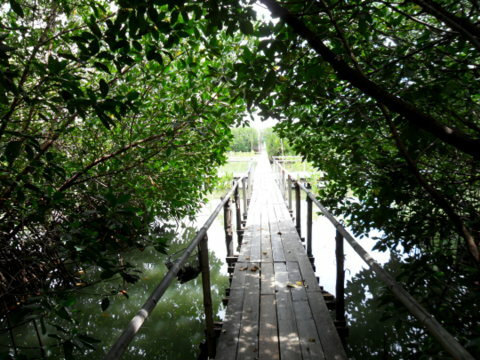 The entire area is linked by wooden walkways, with huts that are meant as outdoor classrooms. Today, some of these farming methods are still evident from the numerous shrimp farms on either side of the long road to the Bang Khun Thien Museum. 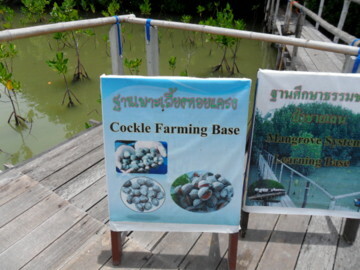 Seafood restaurants popular with the Bangkok city residents have cropped up to complement these farms. Unfortunately the environment is at risk from the industrial waste discharged from the factories in the surrounding areas and the constant coastal erosion. Large areas have been cleared of vegetation for construction. 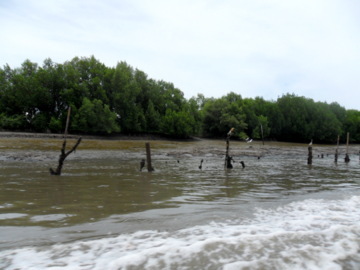 Destruction of some of the mangrove along the coast for shrimp farms over the last three decades has aggravated the erosion of the shoreline. 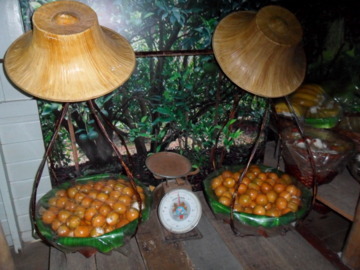 The Bang Khun Thien Museum captures the historical and ecological significance of the area and its old communities. It’s located in the heart of the community whose heritage it now preserves and some of these practices are still evident today. 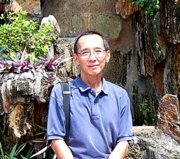 I first visited the Bang Khun Thien Museum on a Sunday in 2005. Back then the access road was a bumpy and dusty unpaved road much to the annoyance of the grumpy taxi driver taking me in. The area around the Klong Phitayalongkorn School was deserted and I don’t remember seeing very many people then.On my second visit on Sunday 12 May 2013, it was so different. The road to the coast is now metalled and it was a smooth ride in. The first half of the 20 km road is also more built-up now with factories, commercial and residential buildings. Thankfully the second half of the road nearer the coast is still preserved. The ponds and canals are still there with the sea-food restaurants. The junction where the school and museum is located has more buildings and a parking area for visitors from the city. Near the parking lot, there’s a pier with a boat service taking visitors to the tour the coast and to a seafood restaurant that’s right on the coast. There’s a new building for the Bang Khun Thien Museum just next to the school. But the museum has not moved to the new building yet. It’s still in a single building to the rear of the school just like my first visit in 2005. The administrator in the museum is unsure as to when the Bangkok Metropolitan Authority which is in charge of these community museums will make the move. The Klong Phitayalongkorn School is going to get a new building as well which was under construction during my visit. During my second visit, I took these photos, added to this page and also updated the page with recent developments, including the nature project to the rear of the school. *Song taeow - a pickup converted for passengers to be seated facing each other on two rows of seats at the rear. Hence the name "song taeow" - two rows. They run on fixed routes at fixed fares. Air-conditioned bus service no.76 goes from Pratunam - Ratchadamri Road - Silom Road - Surasak Road - Taksin Bridge - Krung thonburi Road - King Taksin Road - Suksawat Road - Rama II. Don't stop at the Big C. The song taeow there don't go all the way to Phitaylongkorn. Stop at the bus stop after the junction of Rama II Road/ Bang Khun Thien - Chai Talay Road. The bus stop is opposite the Rama II Park, a shopping and entertainment mall. 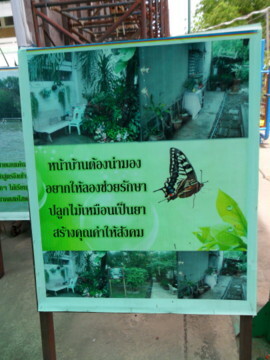 Please refer to the map to Bang Khun Museum for the location of this bus stop. From there take the song taeow that is blue but with a red panel above the drivers' cab. The words are in Thai, so ask before boarding. Tell the driver you are going to "Phitayalongkorn School". On the return trip the song taeow will take you back to this bus stop. Cross the overhead pedestrian bridge and take a bus back to the city. 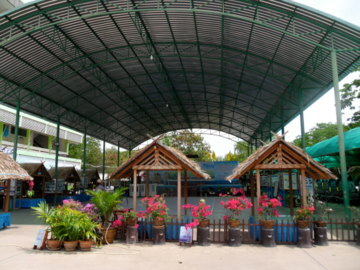 If you don't feel adventurous, take the bus and drop off at Big C. Then take a taxi to the Phitayalongkorn School. On your return trip, take a taxi to the Central Department Store opposite the Big C and take a bus back to the city. Like all community museums, the Bang Khun Thien Museum is open from Wednesday to Sunday from 09:00 am – 03:00 pm. The museum is closed on Mondays and Tuesdays. My thanks to Khun Tip the administrator in the Bang Khun Thien Museum for her helpfulness during my visit. She kindly directed me to the farm and nature project to the rear of the school which proved to be the most interesting part of the visit. Even when the museum moves to the new building, make it point to ask permission at the school to visit this area. It’s like a model of what Bang Khun Thien used to be.